The Man Who Double-Crossed The Founders In An Artist In Treason, author Andro Linklater recounts the double life of Revolutionary War hero James Wilkinson and how he won the trust of America's first presidents — while selling their secrets to Spain. 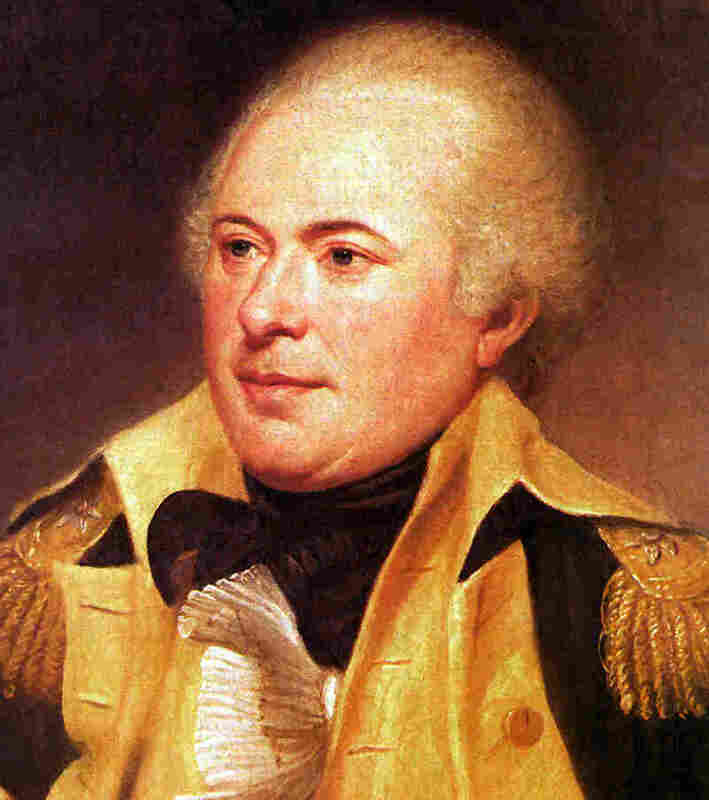 James Wilkinson rose to the rank of brigadier general during the Revolutionary War, and after a break from military service was commissioned a major general in the War of 1812. It was just after the Revolutionary War — at a time when a young United States and a mighty Spain were fighting for control of North America — that American war hero James Wilkinson marched across the border between the U.S. and Spanish-ruled Louisiana to sign a secret allegiance to Spain. "Some people are born to treachery," author Andro Linklater tells NPR's Steve Inskeep, "and I think he was." 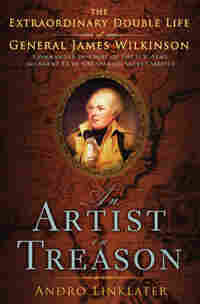 The most notorious American traitor you've probably never heard of, Gen. James Wilkinson is the subject of Linklater's book An Artist in Treason: The Extraordinary Double Life of General James Wilkinson. Wilkinson's betrayals began after his service in the Continental Army ended. He crossed the Appalachian Mountains and joined the masses of pioneers eager to profit in the fertile Kentucky fields. He became a land speculator — and then, like many of his fellow homesteaders, fell promptly into debt. But Wilkinson had charm — it would come in handy later, in his career as a spy — to help him survive. "There was a guy, very old-timer, and he said he could remember Wilkinson being called on by somebody he owed money to," Linklater says. "The conversation went on all afternoon, and when it was over, the guy Wilkinson owed money to came away having lent him another $500." Soon enough, though, Wilkinson had found another, more lucrative form of survival: selling American secrets to the Spanish empire. "As a spy, his tradecraft was excellent. Wilkinson sent his information in a code — just rows of numbers in groups of four," Linklater says. "It was never broken." Through these coded messages, Wilkinson informed the Spanish of the Lewis and Clark expedition and its secret goal of finding a land route through the Western mountains and to the Pacific Ocean. He suggested that his paymasters send armed patrols to intercept the expedition — which the Spanish did. "Only by the grace of God did they fail to find them," Linklater says. If the Spanish patrols had been luckier or more skillful, we might remember Lewis and Clark — if we remembered them at all — as two explorers who vanished in the West. And the course of American history might well have been dramatically altered. Wilkinson also recommended that the Spanish build huge defensive lines to prevent American expansion westward after the Louisiana Purchase — again, advice that Spain acted upon. Andro Linklater's nonfiction books include Measuring America: How an Untamed Wilderness Shaped the United States and Fulfilled the Promise of Democracy and Wild People: Travels with Borneo's Head-Hunters. The real problem for Wilkinson was getting paid for his intelligence, which was the only reason he had become a spy in the first place. Wilkinson was hard pressed to find a way of secretly transporting the loud, unwieldy payments the Spanish sent him — thousands of silver dollars at a time. He tried packing them in casks used for sugar, coffee and rum, but the clinking of the cash made it hard to hide the barrels' valuable contents. "On one occasion, one of his messengers, who was carrying about 3,000 silver dollars, was murdered by his boatmen," Linklater says. "At that moment, Wilkinson absolutely came to the very edge of being discovered." The five murderers, all Spanish, took the money and scattered across the Kentucky countryside, but were soon captured and taken before a magistrate. As luck would have it, though, the assassins spoke no English — and Thomas Power, the interpreter the magistrate sent for, was secretly another Spanish spy. With Power there to translate, the Spaniards explained that the money they had stolen was in fact a payment for information Wilkinson had sold to Spain. But what Power told the magistrate, Linklater recounts, was: "'They just say they're wicked murderers motivated by greed.'" And just like that, Wilkinson got away. In fact, Wilkinson got away with a lot, considering how many people distrusted him. "Almost everyone suspected him of passing information to Spain," Linklater says. "Every single president from Washington to Madison knew of people's suspicions about him. And yet they all trusted him." And while his indecipherable code made it impossible to link him to the leaks, it couldn't stop the accusations. "His career virtually ended [eventually], because one after another the rats come out of the woodwork," Linklater says. "They all betray him — left, right and center — but they can't find his code. They can't break the code, they can't prove that he got paid. He faced about four or five public inquiries, two or three court martials, and each time he was found not guilty." It wasn't until the 20th century, long after Wilkinson's death, that historians finally uncovered documentation of his connection to the Spanish empire. So as far as Wilkinson himself was concerned, he pretty much got away with treason. Linklater says the story of a man who walked among the Founding Fathers while simultaneously plotting against them is invaluable because of how it reminds us that the United States was not always destined for greatness. "To see history through a villain's eyes rather than through the heroic eyes of the Founding Fathers," he says, "is to see just what dangers did face the United States — and what a fate it did escape." Lieutenant Colonel Thomas Cushing, commanding officer of the Second Regiment, could remember precisely the moment when his general held the fate of the country in his hands. "On the 8th of October 1806, I was sitting at the dining-table in my quarters at Natchitoches with General Wilkinson when a gentleman entered the room." The newcomer was a young New Yorker named Samuel Swartwout. His ostensible purpose in coming to the tiny settlement, situated on what was then the southwestern border of the United States, was to volunteer to serve in the forthcoming war with Spain. Since the two officers had been deployed to Natchitoches together with a force of twelve hundred troops in anticipation of such a war, Cushing found, as he said, nothing in Swartwout's explanation "which could excite a suspicion against him." The cause of the approaching hostilities was a dispute between the United States of America and His Catholic Majesty Carlos IV about the border between the Spanish province of Texas and the western extent of the Louisiana Purchase. Trouble had been brewing ever since France sold the vast territory to the United States in 1803. The quarrel now threatened to boil over. The Spanish had stationed more than one thousand troops in Nacogdoches in Texas and occupied positions on what the United States regarded as its territory. In response, President Thomas Jefferson's administration had ordered General James Wilkinson, commander of the U.S. army, to "counteract the hostile views or obvious intentions of the invaders." Already on its way to Washington was Wilkinson's assurance that with the forces available "I shall be able to drive our opponents before me and take Nacodoches." It would be a popular war. People within the United States, and especially in the west, had a pent-up desire to attack their giant neighbor. In Tennessee and Kentucky, militia generals such as Andrew Jackson and John Adair had promised to lead thousands of citizen-soldiers into Spanish territory once the conflict began. All it required was the first shot to be fired and the first blood spilt. Routine business called the colonel from his office, leaving Swartwout alone with the general. "The next morning," Cushing recalled, "I was walking on the gallery, in front of my quarters, when General Wilkinson came up, and taking me aside, informed me that he had something of a serious nature to communicate to me." While the colonel was out of the room, Swartwout had handed the general a package that included a letter from former vice president Aaron Burr. It told Wilkinson, his old friend, of Burr's plan to seize New Orleans and use it as a base to attack Mexico. "A great number of individuals possessing wealth, popularity and talents," Wilkinson informed Cushing, "are, at this moment, associated for purposes inimical to the government of the United States: Colonel Burr is at their head, and the young gentleman ... is one of his emissaries." The letter explicitly stated that Wilkinson was to be regarded as Burr's lieutenant. It also made clear that the success of the conspiracy depended upon war with Spain. Until then, Cushing later explained, he had never heard of the Burr Conspiracy. He recalled that Wilkinson dismissed any suggestion of having collaborated with the former vice president. What the general wanted to discuss was the danger of giving Burr inadvertent help by attacking Nacogdoches. War with Spain would force the army to fight on the frontier, leaving New Orleans defenseless. There would be nothing to stop Burr from seizing the city and putting into effect a project that might dismember the fragile United States. On the other hand, if Wilkinson retreated to deal with Burr, the border would be left undefended. The general's choice would determine the future of the United States. Although the straightforward Cushing did not realize it, another, more secret outcome weighed equally heavily with the general. Whether he turned against Aaron Burr or helped him, James Wilkinson risked being exposed as a traitor himself. 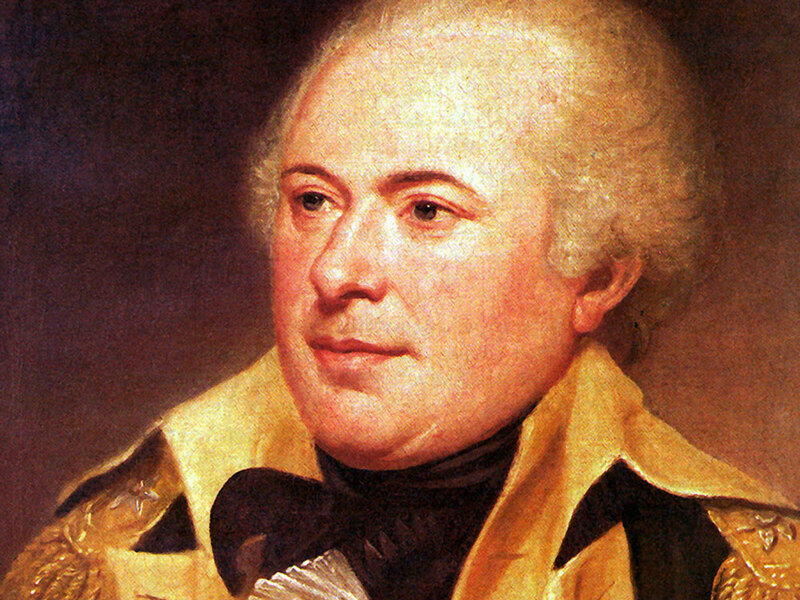 Ever since 1797, James Wilkinson had been the senior general in the U.S. army. Throughout that period, he was also Agent 13 in the Spanish secret service. At a time when Spain's empire dominated North America, occupying until 1803 an area three times that of the United States, General Wilkinson not only passed on his country's strategic secrets, he sought to detach Kentucky from the Union and wrote detailed plans advising the Spanish authorities on the best way to prevent American expansion beyond the Mississippi. In the words of Frederick Jackson Turner, Wilkinson was "the most consummate artist in treason the nation has ever possessed." That evocative description aptly conveys the reputation that Wilkinson enjoys today. Yet one aspect of his career as a secret agent should make one pause. It was hardly secret at all. For most his life, he was repeatedly referred to as a "Spanish pensioner." Letters were sent to the first four presidents warning of his activities. Numerous pamphlets were printed accusing him of being a traitor. In Kentucky an entire newspaper, the Western World, was devoted to exposing him. Accusations of collusion were made by congressmen of every political persuasion. Nor were these charges overlooked. Presidents George Washington, John Adams, Thomas Jefferson, and James Madison, together with half a dozen different secretaries of war, not to mention a score of their cabinet colleagues, were all aware of his close contacts with the Spanish authorities in New Orleans and Madrid. No fewer than four official inquiries were mounted into the allegations against the general. It is impossible to disguise the unease that treachery arouses. To excuse it is to risk losing sight of one of the yardsticks — love of country — by which moral living is measured. Yet one administration after another chose to confirm Wilkinson in command of the U.S. army. Unless a collective blindness was at work, his political contemporaries found in him some other quality that outweighed suspicions about his loyalty. What makes the story of James Wilkinson's double life truly compelling is the light that it casts upon the early years of the United States. The federal union was newly knit, and its government untested. Its very identity was more tenuous than seems imaginable today. There was no certainty that "the experiment in democracy" would take hold, no inevitability about the survival of liberty, no guarantee about the growth of power and territory. Failure threatened every political choice. In the republic's barely formed state, the loyalty of the army posed a particular danger. The military structure — its rigid hierarchy and unquestioning obedience to orders from above — resembled an absolutist monarchy and was thought to make professional soldiers sympathetic to the values of autocratic rulers. In Whig mythology, "a standing army" was, therefore, always viewed as a threat to democratic, civilian government. The nightmare was acted out in France on November 9, 1799, when Napoleon used his troops to sweep aside a government and constitution approved by half a million French voters. To many of the founding generation of Americans, and especially to Thomas Jefferson's followers, it was clear that the republic had to counter this inescapable threat. Successive administrations gambled that the general's influence in taming the army would outweigh the risk of his tendency to treachery. The bet paid off. Every post-revolutionary government in the American hemisphere has had to undergo the ordeal of a military coup, with the exception of the United States. The key to its good fortune was the prolonged, intricate collusion that took place between the founding fathers and the artist in treason. Thus the paradox running through James Wilkinson's career is the service he performed for the United States while he was unmistakably betraying it. That tortured relationship reached its peak with Thomas Jefferson, who not only confirmed Wilkinson as commander of the U.S. army, but appointed him to the posts of governor of Louisiana Territory and commissioner of Indian affairs. No president trusted Wilkinson more, or asked so much in return, or, at the apogee of Aaron Burr's conspiracy, came closer to a catastrophic misjudgment of Wilkinson's uncertain loyalties. As Congressman John Randolph pointed out, "The agency of the Army was the whole pivot on which that plot turned." Why then did James Wilkinson choose to defend his country at the cost, as it turned out, of his career? The fear of being found out haunted the general throughout his life as a spy. His tradecraft was exemplary. He rarely met his handlers. He communicated through a wide range of ciphers and codes, some of which remain unbreakable because the source books have been lost. He took pains to ensure that his payment in silver dollars came hidden in casks of coffee and sugar and was laundered through banks and real estate deals. To explain away any transfers of money that came to light, he had a watertight cover story backed by forged documents and false testimonials showing them to be the outcome of commercial deals. The effectiveness of his methods was such that although he faced four official investigations, and many more private and newspaper inquiries, none turned up any hard evidence that he had actually passed information on to Spain in return for money. Nevertheless, Wilkinson was well aware that in one area he remained vulnerable. He could do nothing about the bureaucratic efficiency of the Spanish imperial government. 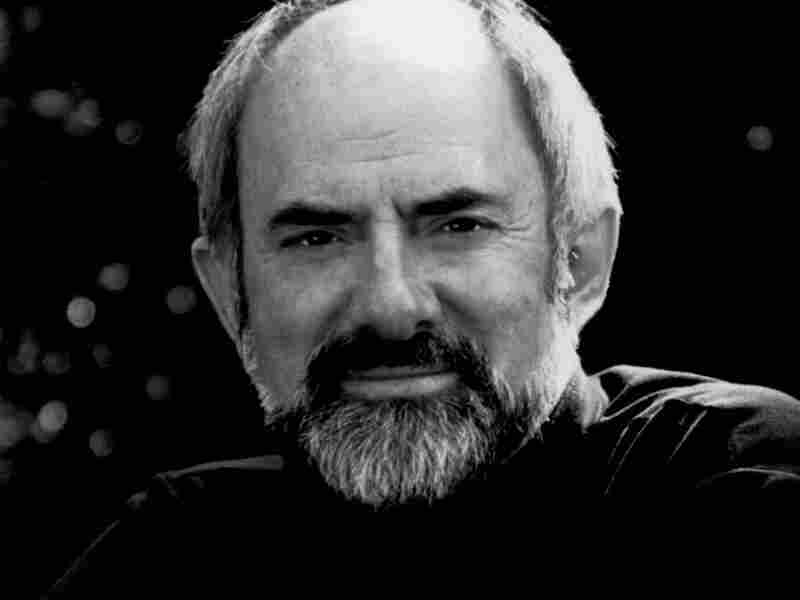 Once deciphered, his reports were copied in duplicate, sometimes in triplicate, so that local officials in New Orleans, their regional superiors in Havana, and their central masters in Madrid would all be aware of what Agent 13, the key Spanish operative in North America, had to disclose. Repeatedly, he begged his handlers to destroy his letters, "to hide them in deepest oblivion." When the empire began to crumble, his anxieties became acute. To reassure him, one of his last Spanish contacts, Governor Don Vizente Folch of West Florida, grandly promised him that every incriminating document had been sent to Havana, and "before the United States shall be in a position to conquer that capital, you and I, Jefferson, Madison, with all the secretaries of the different departments ... will have made many days' journey on the voyage to the other world." So it proved, and Wilkinson died before his secret was uncovered. But in the last years of the nineteenth century a cache of papers relating to his activities was found in Baton Rouge, Louisiana. Not until the first quarter of the twentieth century, however, when a succession of dogged historians began to dig through the estimated two hundred thousand documents sent back from Havana to Madrid in 1888, was the smoking gun found. 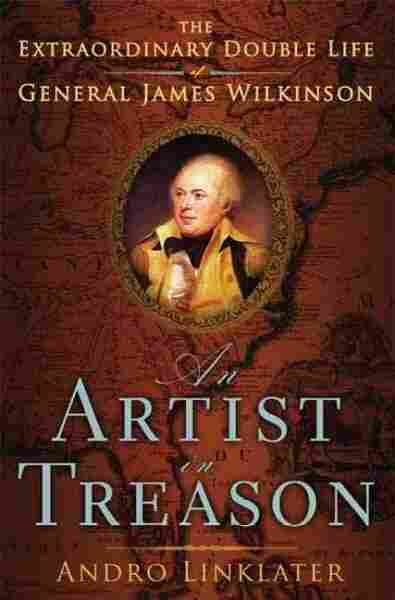 From An Artist in Treason: The Extraordinary Double Life of General James Wilkinson. Copyright 2009 by Andro Linklater. Reprinted by permission of Walker and Company.